Hydro-Force Professional Leather Revitalizer protects leather from cracking and premature aging, by providing the essential oils and lubrication that it needs to remain soft and supple. Leather that is not regularly revitalized can become dry and stiff. Hydro-Force Professional Leather Revitalizer replenishes the natural moisture and oil that can removed from leather by time (light, direct sunlight, dry air, heat, soiling) and improper cleaning agents. It restores the leather to the original scent, feel, and touch, while extending the investment. It brings out the natural color and grain of the original leather. Hydro-Force Professional Leather Revitalizer penetrates easily into the pores of leather providing natural lubrication without leaving an oily residue. 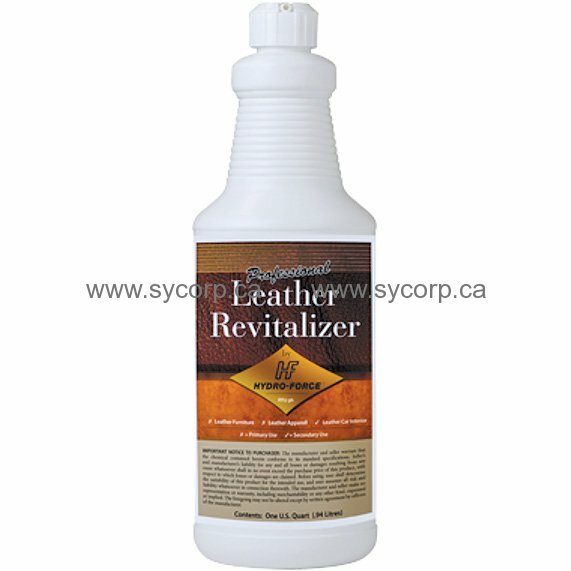 Use Hydro-Force Professional Leather Revitalizer regularly to keep leather looking and performing at it's best and to restore the soft, supple feel and functionality of leather that has become dry and stiff from exposure to direct sunlight, dry climate, harsh cleaning agents and other factors. It meets or exceeds the performance standards of leading Italian leather conditioners with a more economical price. It is easy to apply and easy to use. It is the perfect leather conditioner for your customer's fine upholstered leather furniture, but can also be safely and effectively used on auto leather, leather jackets, luggage, handbags, and more.